HISTORY AS ITâ€™S SUPPOSED TO BE TOLD: TRUE AND THRILLING. Thomas Edison was a bad guyâ€” and bad guys usually lose in the end. World War II radio host â€œTokyo Roseâ€ was branded as a traitor by the U.S. government and served time in prison. In reality, she was a hero to many. Twenty U.S. soldiers received medals of honor at the Battle of Wounded Kneeâ€”yet this wasnâ€™t a battle at all; it was a massacre. Paul Revereâ€™s midnight ride was nothing compared to the ride made by a guy named Jack whom youâ€™ve probably never heard of. The things youâ€™ve never learned about our past will shock you. The reason why gun control is so important to government elites can be found in a story about Athens that no one dares teach. Not the city in ancient Greece, but the one in 1946 Tennessee. The power of an individual who trusts his gut can be found in the story of the man who stopped the twentieth hijacker from being part of 9/11. And a lesson on what happens when an all-powerful president is in need of positive headlines is revealed in a story about eight saboteurs who invaded America during World War II. 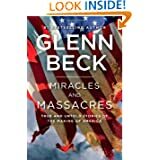 Miracles and Massacres is history as youâ€™ve never heard it told. Itâ€™s incredible events that you never knew existed. And itâ€™s stories so important and relevant to today that you wonâ€™t have to ask, Why didnâ€™t they teach me this? You will instantly know. If the truth shall set you free, then your freedom begins on page one of this book. By the end, your understanding of the lies and half-truths youâ€™ve been taught may change, but your perception of who we are as Americans and where our country is headed definitely will.